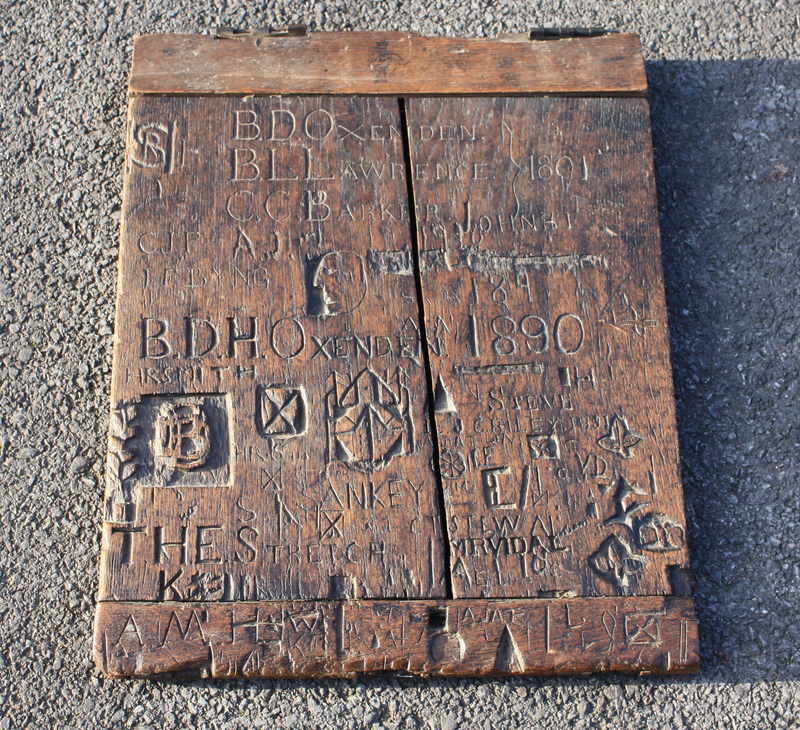 A lid from an oak desk of the kind in use in Big School from the 1860s until the 1920s. For nearly eighty years every boy in the school sat behind a desk like this, and for nearly eighty years the desk lids were the primary (officially the only, and always unofficial) graffitied objects in the school. The desk lids became so iconic that when the desks went out of use in the 1920s, Warden Fox proposed that the lids should be saved and used to panel Covered Passage. In the end, after months of languishing in storage in the Old Gym, only four desk lids survived, three to be made into the back of a garden bench now long decayed and thrown away, and one, chosen at random, to be kept forever as a museum piece. This is about public and private space; it is about the relationship between schoolboy and classroom, and between schoolboy and teacher; it is about the temporary and the permanent; and about anonymity and making your mark. But his most popular experiment was to drive a little toy locomotive engine, using liquid air as the motive power. A set of rails would have made this experiment more effective, for the lecture table was a much worn school desk on which the knives of Radley boys had worked many irregularities, and these caused frequent stops to the poor little toiling engine. 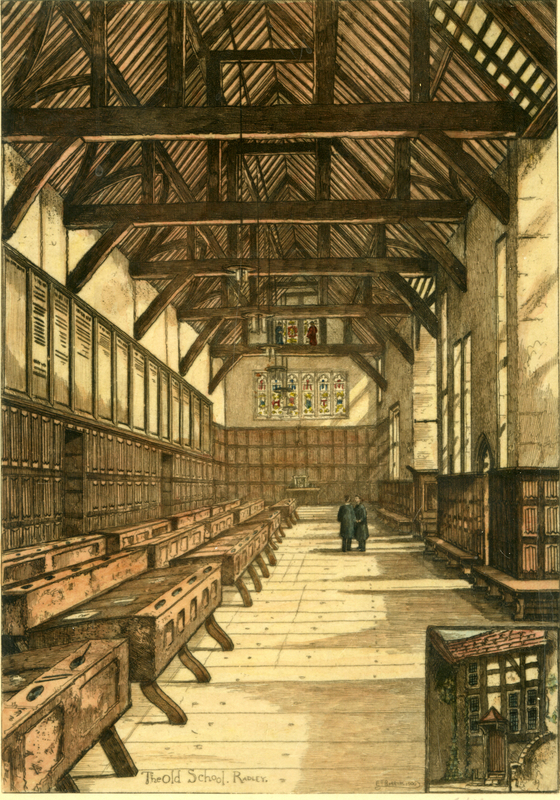 …there should be a “Carpenter’s shop” here as at Tonbridge, Clifton and many other schools. Carpentering is a thing which is useful at all times, and I think it would be a great improvement if it were more widely taught … We also see instances of the boys’ ingenuity in the carving of the desks in school. Do you not think that this could be turned to some better account? Two names have been obliterated, but otherwise each carver has respected the work of his predecessors, finding space for his own mark amongst all the others. The message is uncompromising and personal: name or initials and date. There is no room here for rude messages about the boy at the next desk. The iconography is heraldic, recognisable symbols relating to family or club. There are no phalluses here, nor any of the ‘squalid scribbling and scratching with which some later Radleians have adorned their desks’ as described by AK Boyd in 1947. All the carving is on the top surface of the desk lid – there is only one letter (upside down from the desk user’s point of view) on the inside. These are ownership marks, or memorial inscriptions, for public consumption; they are not about rebellion. I love my own sweet voice. So to the names which have been rescued from oblivion, which were each valuable to the individual boy by proclaiming that he was there. Any list of boys’ names from the 1890s strikes a chill, since this was the generation that went into the trenches of World War 1. However, these boys were old enough to be senior officers and so had a greater survival rate than their juniors a decade later. Of the thirteen individuals who can be identified with certainty, all those who served survived the War. One, Tom Kingham, went so far as to find love not war in Vichy in 1915. Two, Basil Lawrence and Theo Stretch, died before WW1, but another, AElfric Riley, lived to be 93 and died as recently as 1979. They were also totally modern: on leaving school, two went straight into industries which were created by inventions or discoveries that had not existed when they carved their names on the desk – Basil Lawrence into Daracq racing cars and Richard Sankey becoming a consultant radiologist working with x-rays. Others achieved distinction in their chosen professions, two were awarded the OBE (Monty Vidal) and MBE (Harold Smith); three became Fellows of Professional Institutes – Harold Smith and Clifford Steward as professional surveyors and Richard Sankey, the Institute of Radiologists. 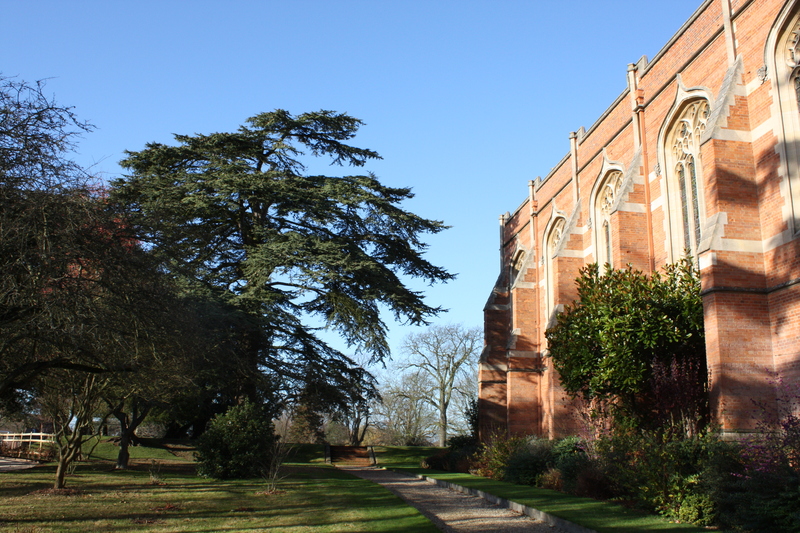 Several continued to play the sports they had enjoyed at Radley, one, Charles Barker, played hockey for Middlesex, another, Clifford Steward, served on the Henley Regatta Committee for nearly twenty-five years, whilst a third, Theo Stretch, was haled as one of Radley’s greatest oarsmen, and rowed in winning crews for Oxford University and Leander. 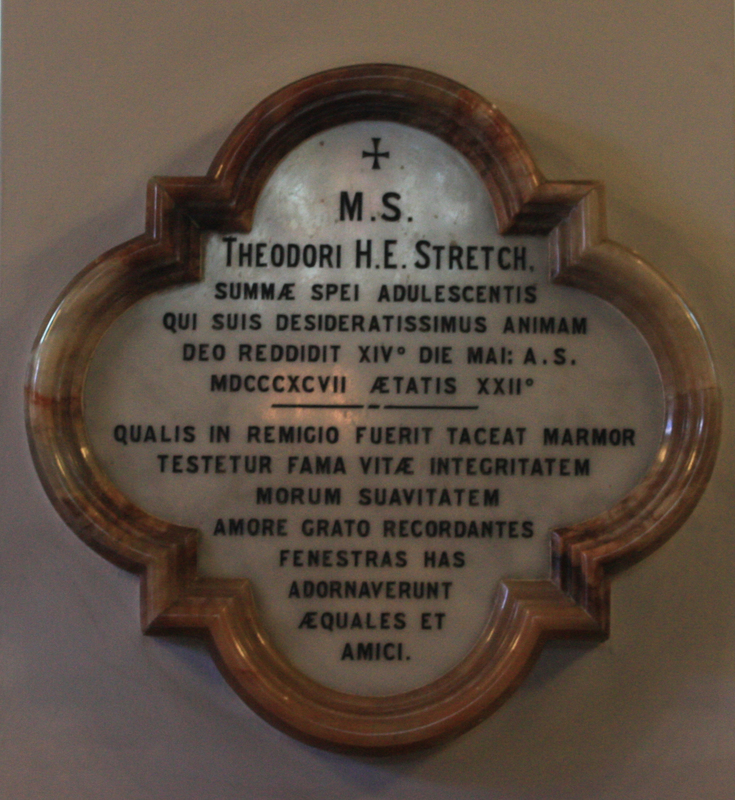 Only Theo Stretch is commemorated by name on a memorial at Radley in the stained glass of the ante-chapel, but three others left lasting contributions: Clifford Steward designed the Evans Memorial Boat House in 1911, now replaced; the father of the Riley brothers planted 370 trees in the grounds in 1897, several of which survive, especially the cedar to the south of chapel; and Monty Vidal kept a photographic record of his entire time at Radley which was bequeathed to the Archives. But none of this could have been predicted when each carved his name as a Remove. They are to protect the whole School in their privacy. Every desk is to be accounted a sacred spot, into which no companion’s eye is to be allowed to penetrate without the owner’s free consent. It is almost essential to everyone’s happiness that he should have one spot at least in the world, however small, that he may call his own; let every boy have a real interest in his desk. Desk.- A receptacle for books. Every boy will understand that books are to form the very minimum of the contents of the desk, and that they are to be scattered in lavish profusion over the desks of other people. 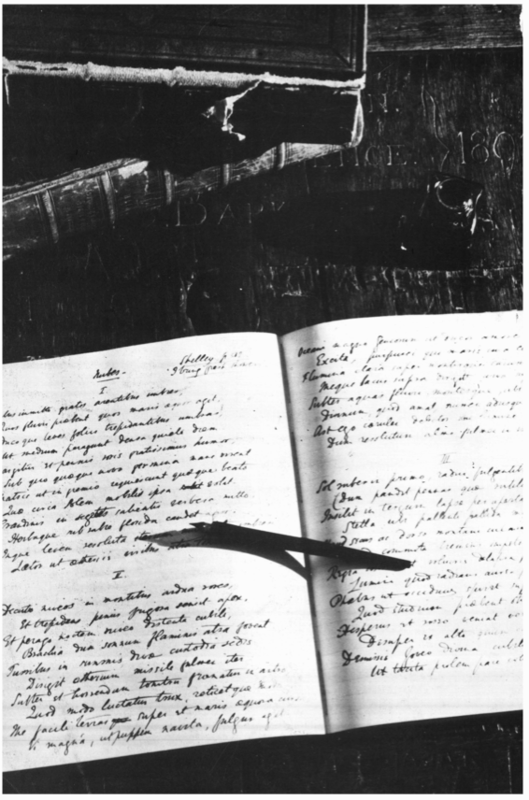 To write a verse I cannot shirk. For me to see what he will say. Upon the school’s new desks and frames. In 1987 the cover of The Radleian celebrated the carved desk lid, featuring two montages, the contemporary and the historic. 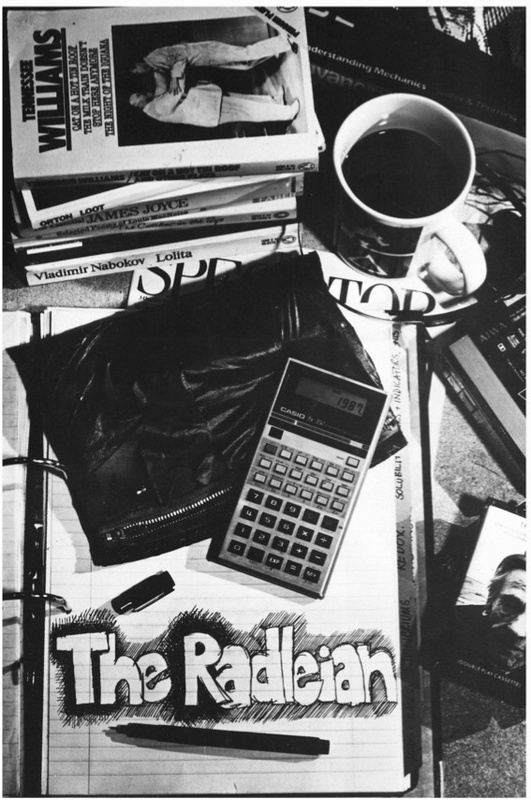 The 1987 desk illustrates the private space in a study – the coffee mug, music CD, copy of The Spectator; then the public face of education, the portable aspects of the desk which are moved from classroom to classroom to study – the file of notepaper, the pile of books, the pencil case, and the calculator. The monumental graffiti on the paper pays homage to the carved desk lid. But the calculator looks forward. It anticipates 2012 when the schoolboy and teacher have equal access to the same object: a fully portable, totally private, personal space, accessing the public, communally-created desk and classroom complete with notes, writing implements, books, music, even a form of pet mouse – the iPad.